Risk assessment and threat management surveys. Safe storage facilities for valuables (long and short term options available) – featuring biometric client identification systems which give clients access to a secure vault where the temperature and humidity are monitored and controlled 24 hours a day. Luxury bullet resistant armoured cars for hire and after-market options for the armouring of your vehicles. Aircraft charter available 24 hours a day 365 days a year to or from ANY destination. In co-operation with our professional and reliable flight partners, we place your order for helicopters and private aircrafts of all kinds. Ranging from turboprop to large jets, the fleet allows you to cover large distances in the shortest time possible. We strive to ensure that your every need is catered fro so that you arrive at your destination rested and relaxed. Assistance with humanitarian support initiatives and the co-ordination and delivery of aid for disaster relief projects. International crisis management and response for private persons and companies. Maritime security services – port security, counter piracy consultation and services for shipping companies as well as for private vessels. Aviation security and secure aircraft services. Surveillance and counter surveillance services. Background checks and qualification verification. Polygraph and substance abuse testing. Personal protection is available to individuals or groups that may require close protection services. Our disciplined close protection officers are prepared to take action at a moment’s notice and safeguard clients who are at risk. Trained in accordance with the highest industry standards, our protection officers specialize in proactive security tactics designed to detect, assess, and neutralize risks before they become dangerous situations. All our C.P.O’s are highly trained and constantly receive on going training in their specific fields, we have the ability to provide personal protection services to clients based either locally or internationally. All of our staff and contractors are registered security providers with the Private Security Industry Regulatory Authority. (Stratagem Risk International PSIRA reg no. 1921275). Given South Africa’s high level of violent crime and hijacking there is a clear need for greater security. Analysis of hijackings in s.a shows that the majority of hijackings are committed with handguns. These threats may be neutralized by entry level B4 vehicle armour. Stratagem is able to provide level B4, B6 and B7 bullet resistant passenger vehicles for government officials, business executives, or any other individual who perceives a threat to their safety. These vehicles offer clients protection from robbery, kidnapping, car hijacking or other violent attacks with handguns, shotguns or assault weapons. By combining lightweight ballistic glass which is optically indiscernible from the original OEM glass, with “Armormax”, which is a combination of synthetic fibres, the entire passenger cabin is protected. This composite technology is ten times stronger than ballistic steel. The vehicles used by stratagem can hardly be distinguished from a standard model of the same make. This acts as an added defense mechanism whereby the attackers experience a certain level of shock when their attempts to disable the vehicle by shooting at the occupants are completely unsuccessful. This gives the driver more than enough time to negotiate the situation and drive away as soon as possible in a safe and calculated manner. These vehicles are fitted with run flat tyres and or safety bands. This means that you can continue driving after the tyres have been shot at, after driving over sharp objects or at danger points such as traffic lights, narrow places, and construction sites or in tunnels. The tyre change can wait till you are out of danger. Stratagem consultants are able to assess your level of risk and provide the necessary information and options regarding which vehicle would best suit your needs. Stratagem will attempt to source used protection model vehicles, convert existing standard vehicles to bullet resistant models or aid in the selling of these protection vehicles for clients who wish to upgrade their existing vehicles. We have fixed wing aircraft and helicopters available for charter. By providing protection personnel the aircraft and the pilots we are able to assure our clients of complete privacy, their destinations and security are not compromised by outside parties. In co-operation with our professional and reliable partner, we place your order for helicopters and private aircraft of all kinds. Ranging from turboprop to large jets, the fleet allows you to cover large distances in the shortest time possible. We strive to ensure that your every need is catered for so that you arrive at you destination rested and relaxed. We offer a 24 hour service that includes flight monitoring from take off to landing. We also provide meals and many other services for example internet connections and fax facilities. Chartering a private aircraft means that your travel plans and destinations are kept private and your conversations confidential. Fly when and where you want. Avoid long check in queues and other time consuming delays normally associated with commercial aircraft travel. Nic has over 7500 hours of flight time, is a grade 2 instructor and test pilot, and has five years experience as a qualified aviation safety officer. All our pilots are mature, dedicated and highly experienced professional pilots who will meet the highest standard expected by you. All our pilots are subjected to regular stringent proficiency training and evaluation. The proficiency checks and recurrence training demanded from our pilots is aimed at keeping them at the highest level of skill and capability at all times. All our pilots are evaluation, trained and supervised by our Chief Pilot and in-house Grade 1 Designated Examiner. The aircrew draws experience from Medivac (Medical Evacuation Rescue), Corporate aviation, charter, airline and military backgrounds. Recurrent IF (Instrument Flying) training. CRM (cockpit resource management) currency courses. Proficiency checks on emergency procedures in the aircraft. Company SOP (Standard operating procedures) training. 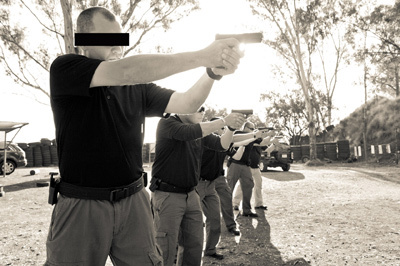 TRAINING: Our instructors all have more than 10 years of experience locally and internationally in their respective fields whether it be police, military, private security or protection companies and are SETA registered. We only use accredited firearms training service providers and have our own private shooting range. We offer courses in all aspects of firearm training from Competency for individuals and companies to advanced SWAT, handgun, shotgun, rifle and hand machine carbine courses. Tactical firearm training, various levels of training in the use of handgun shotgun, rifle and hand machine carbine. Close protection officer training courses. Hand to hand and close quarter’s battle training. Other courses or the above mentioned courses may be customised to suit our client’s needs.